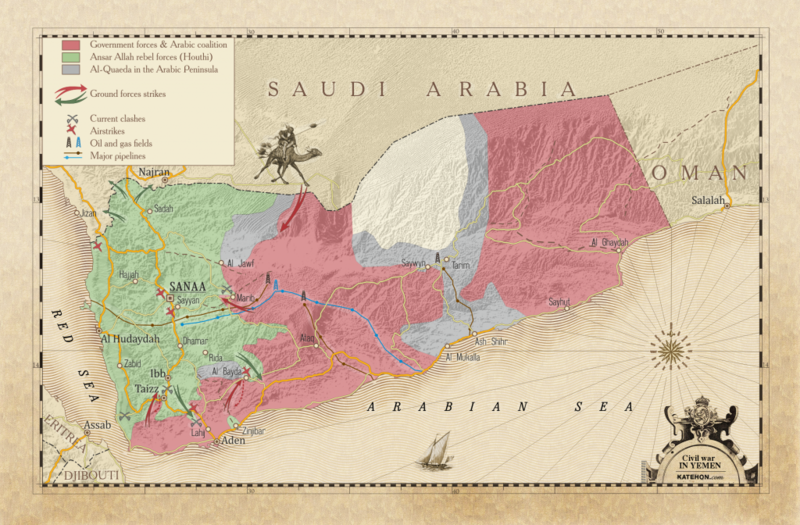 In the one day and night period covered here, attacked were the capital Sana'a and Sa'dah, Marib, AlJawf, Hajjah, Hodeidah. Sana'a: Fourteen attacks, four air raids targeted the communications network in Nqil Yeslih in Sanhan Directorate. · Six air strikes targeting al Madfoon district in Nehm Directorate. · Four strikes targeting Daboa'h in Nehm Directorate. · Forty five air raids targeted areas of Mandabah, al-Magda and Asharaf and Gulal Shaibani in Baqem district. · Airstrike targeted a government complex building led to the destruction of the building in Al-Daher Directorate. · Another airstrike targeted a private sector stone crusher in A-Daher Directorate. · Two air raids targeted Malaheeth District in Al-Daher Directorate. · Two air raids targeted the Alhesamah District in Shada'a Directorate . Five air raids targeted Al-Boqa' District in Kitaf Directorate. · Seven strikes on houses and farms destroyed three houses and four farms in Ibad area, Baqim Directorate. · A strike targeted a house in the area of ​​Souda, Baqim Directorate. · Saudi rockets and artillery shelling targeted scattered areas in Razih District . · Five air strikes targeting Maran area in Haydan district. Hajjah province: Seven raids targeted Midi District. Hodeidah Province: One air raid led to a death in the area Alhemah District, al Khokhah Directorate. Al-Jawf province: Eight strikes with a woman injured, the targeting of a house resulted in the destruction and damage to fifteen nearby houses in Al Ghayl District. · Twelve mercenaries loyal to Saudi Coalition were killed and nine injured by Saudi air raid targeting a house in Al Ghayl District. · Three air strikes destroyed a house and damaged eighteen adjacent houses also in Al Ghayl District. · Three air strikes further targeted three farms in Al Ghayl District. Marib province: Two air raids targeting Sirwah District and an air strike on Hylan Mountain in Sirwah District. Ironic to remember Kuwait’s “victim” status in 1990, when Iraq was threatened with being “reduced to a pre-industrial age” for taking revenge for Kuwait’s slant drilling theft oil from Iraq’s Rumaila oil fields. Now Kuwait, population just 3.369 million (2013) is now in the gang of murderous bullies decimating a poverty stricken country - no doubt as a thank you to Saudi Arabia for extending hospitality to their ruling family when they fled ahead of the Iraq troops, leaving their subjects to face the onslaught which their theft had generated. Those who unleashed near Armageddon on Iraq over an oil dispute are either silent on or participating in Yemen’s nightmare - and as ever money is talking and the US and Britain are selling the arms and the ‘planes in billions of $s. The double standards of the “international community” and its UN “umbrella” is ever breathtaking. Equally breathtaking is that in July, the UK refused to rule out electing Saudi to its place in the UNHRC for a second time, in spite of Zeid Ra'ad Al Hussein, the UN’s High Commissioner for Human Rights, having stated that “carnage” caused by some Saudi coalition airstrikes appear to be war crimes. Arms sales above flesh and blood, terror, heartbreak and humanity, every time. The writer is indebted to the LCRD for the documentation of the attacks and for the careful translation by Ameen Alharazi.